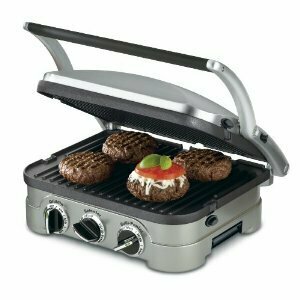 The Cuisinart GR-4N 5 in 1 Griddler makes the term 'multifunctional' an oversimplification! With five separate cooking options to choose from, this combination grill/griddle can easily cook everything from pancakes to steaks, with everything inbetween such as sausages, grilled cheese, hamburgers, and yummy Paninis. This is definitely one of the most flexible machines we have tested in our electric grill reviews. The GR-4N is unique in that it can work as a Full Griddle, a Contact Grill, a Full Grill, a Panini Press, or a Half Grill/Grill Griddle combination, due to it's A floating cover and a set of reversible plates that easily snap in and out. Dual temperature controls give this grill/griddle a big advantage over other units that try to approach it's versatility! Add to that, the GR-4N's floating hinge, which adjusts to the thickness of food, and you have a great little cooking machine! The finish on this griddle is beautiful brushed stainless steel. The GR-4N features a stay-cool handle which ensures you won't burn your fingers. and convenient indicator lights, as well as nonstick grill and griddle plates that are removable, dishwasher-safe, and designed to drain grease away from food for healthier cooking. Two dishwasher safe drip cups for grease collection are included, as well as a scraping tool that is dishwasher safe. The GR-4N measures 11.5 x 13.5 x 7.1 inches, weighs in a bit over 13 lbs, and carries a limited three-year warranty.